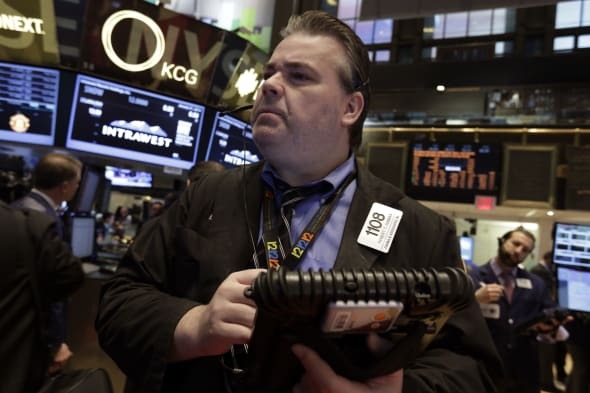 (Reuters) - U.S. stocks slumped on Monday, with the S&P 500 suffering its worst drop since June, after weaker-than-expected data on the factory sector in the world's largest economyprovided investors with the latest reason to move away from riskier assets. U.S. manufacturing grew at a slower pace in January as new order growth plunged by the most in 33 years, while spending onconstruction projects barely rose in December. Investor sentiment soured sharply after the factory data, driving the cost of protection against a drop on the S&P to its highest level in nearly four months. The CBOE volatility index .VIX jumped 16.5 percent to 21.44, its highest level since December 2012. S&P e-mini futures showed 2.999 million contracts traded for the session, the largest volume since February 25, 2013. "Nothing is preserved today - once the market started selling off, that was that," said Keith Bliss, senior vice-president at Cuttone & Co in New York. The Dow Jones industrial average .DJI fell 326.05 points or 2.08 percent, to 15,372.8, the S&P 500 .SPX lost 40.7 points or 2.28 percent, to 1,741.89 and the Nasdaq Composite.IXICdropped 106.919 points or 2.61 percent, to 3,996.958. The Dow closed below its 200-day moving average for the first time since December 28, 2012, a technical breakdown which could indicate further declines. Selling was broad-based, with only nine components in the S&P 500 trading in positive territory. Telecoms .SPLRCL, down 3.7 percent, and consumer discretionary .SPLRCD, down 2.7 percent, were among the worst performing sectors. The Dow Jones Transportation average .DJT dropped 3.2 percent. Stocks have been pressured as the Federal Reserve confirmed its commitment to withdrawing its market-friendly stimulus and by concern about growth in China. China's service-sector growth slowed to a five-year low in another sign of stuttering momentum in the world's second-largest economy. Investors have also become leery about the outlook for emerging markets, where a recent rout in currencies spurred some central banks to raise interest rates or intervene in markets to limit the swings. That, in turn, has pressured bond and stock holdings and forced investors to exit in favor of assets perceived as relatively safe, like the yen and Swiss franc. "This is the best evidence yet, to me, that people knew the Fed's monetary policy in 2013 was doing nothing but providing a definite floor to the equity markets. As soon as they started signaling they were going to pull out of their extraordinary stimulus you saw the unintended consequences," said Bliss. For January, the Dow tumbled 5.3 percent and the S&P 500 slid 3.6 percent - their worst monthly percentage declines since May 2012. With earnings season halfway over, Thomson Reuters data shows that of the 250 companies in the S&P 500 index that have reported earnings, 69.7 percent have topped expectations, above both the 63 percent beat rate since 1994 and the 67 percent rate for the past four quarters. Telecoms were weaker on speculation AT&T Inc's (T.N) plan to cut prices on its large shared data plans could prompt other U.S. carriers, particularly larger rival Verizon Wireless (VZ.N), to offer new discounts. AT&T lost 4.1 percent to $31.95 and Verizon lost 3.4 percent to $46.41. Charter Communications Inc (CHTR.O) is discussing raising its bid for Time Warner Cable Inc (TWC.N), according to people familiar with the matter, a move that could pressure its reluctant rival ahead of a proxy deadline. TWC shares added 0.5 percent to $134.01. Britain's Smith & Nephew (SN.L) is to buy ArthroCare Corp (ARTC.O) for $1.7 billion in cash to strengthen its treatments for sports injuries, an area growing faster than its main replacement hips and knees business. ArthroCare shares rose 8.2 percent to $49.12. Pfizer's (PFE.N) shares edged up 0.7 percent to $30.60, the only Dow stock to close higher. Pfizer's experimental breast cancer drug significantly delayed progression of symptoms in a mid-stage trial, meeting the study's primary goal. Volume was heavy, with about 9.46 billion shares traded on U.S. exchanges, well above the 6.94 billion average in January, according to data from BATS Global Markets. Volume was 8.84 billion on January 24, the last session the S&P 500 fell more than 2 percent. Declining stocks outnumbered advancing ones on the NYSE by 2,610 to 463, while on the Nasdaq, decliners beat advancers 2,286 to 368.